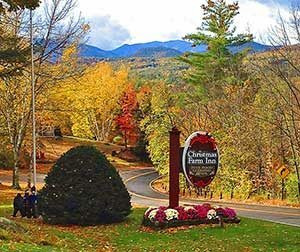 Christmas Farm Inn is in the heart of fall foliage country, surrounded by the beautiful White Mountains. 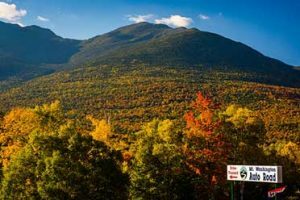 In early September, Visit New Hampshire’s website starts a Foliage Tracker and information specific to different areas of the state, including the White Mountains region. That’s a good barometer to use to time your visit, especially as 2013’s weather has been a tad unusual. Once you are here, there are many amazing trails of varying difficulties that will give you a great view of the pretty autumn colors, as well as the White Mountains’ famous waterfalls. The trails around the Kancamagus Highway are especially impressive. The Boulder Loop Trail near the Covered Bridge Campground is a simple 3.1-mile loop that isn’t too challenging. You’ll see Mt. Chorcorua, Mt. Passaconaway, and Middle Sister and have plenty of chances to rest, snap some photos, and appreciate your surroundings. 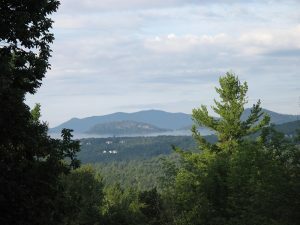 Mount Shaw also offers great views of the area around Lake Winnipesaukee. Mount Kearsarge is a great pick for those with little ones, as the trailhead from Rollins State Park is very short. For older kids, start in Winslow where the trail is a little more challenging. From either direction, you’ll reach a summit with a 360-degree view that is sure to wow you. For those who aren’t interested in hiking, the Kancamagus Highway and Mount Washington Auto Road have excellent views from the comfort of your car or motorcycle. If you want to stick close to the Inn, simply rent one of our Carriage House rooms, which have especially good views of the surrounding landscape. However you choose to enjoy the fall colors, be sure to take Thoreau’s advice and take it all in. This kind of beauty happens only once a year for a few weeks, and you don’t want to miss out on the White Mountains putting on their very best show for you!